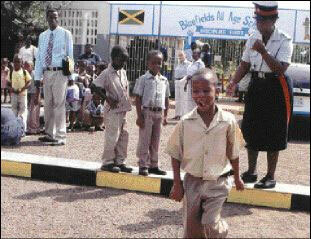 Corporal Andrea Clarke of the Police Traffic headquarters in Kingston teaches children how to walk on the road. The occasion was a Road Safety Talk and demonstration carried out at Bluefields All-Age School in Westmoreland recently. The event was organised by the Urban Development Corporation (UDC) as part of its community development programme and had participants from six basic schools and one All-Age. Caption: Why did the little boy cross the road? Because the policewoman told him to do it. Caption: A nuh mi brok it! Mi na guh a jail! Mi a gu tell mi muma pon yu! Caption: Boy screaming "STOP NUH TAXI MAN ". Caption: "A young boy demonstrating the safe and correct way of crossing the road"
Caption: This is how it is done officer!!! Caption: Mi sey, don\'t cross like him. Wait till mi tell u fi cross. Caption: And the farmer runs away. Thank you for the 58 responses we received. Enter again and we hope you will be the outright winner next time.